Captain America makes a fun superhero costume for kids or kids at heart. Whether you're hoping to emulate the look of Captain America from the movie The Avengers or you're going for more of a classic comic book style, there are plenty of options out there from which to choose. Buying a costume is a good choice if you're in a hurry or you want a very specific look. Remember that there are subtle differences between the movie version of Captain America and the one many people remember from the comic books. Both versions sport a red, white, and blue jumpsuit, but the star on the movie version is smaller. Whichever version you're looking for, there's a costume out there for you. 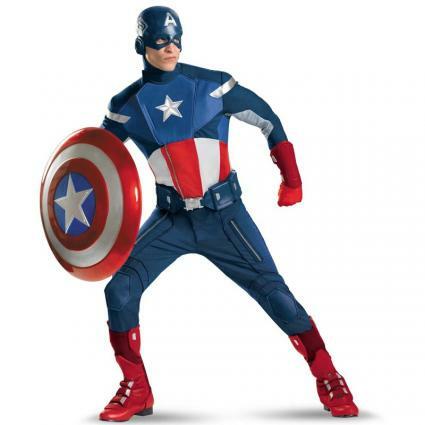 BuyCostumes.com has a great costume that looks almost exactly like Captain America from the movie. Although it's on the pricey side, this costume has everything you need for a complete outfit, including a jumpsuit, gloves, a mask, gauntlets, boot covers, and a belt. You can purchase the shield separately. It retails for about $245 and comes in sizes up to XXL. The Men's Classic Muscle Avengers Captain America Costume is a great choice for adults who want that classic comic book look. Available from CostumeSupercenter.com, this outfit features built-in muscles in the jumpsuit, which also includes an attached belt. This costume comes with a mask and fits up to XL. It retails for about $60. The Kids' Muscle Chest Captain America Costume is a great choice for younger superheroes. Sold by Amazon.com, this costume comes in sizes from 3T to 12. It includes the muscled jumpsuit with attached belt and a separate headpiece. This outfit retails for $20 to $55, depending on the size. 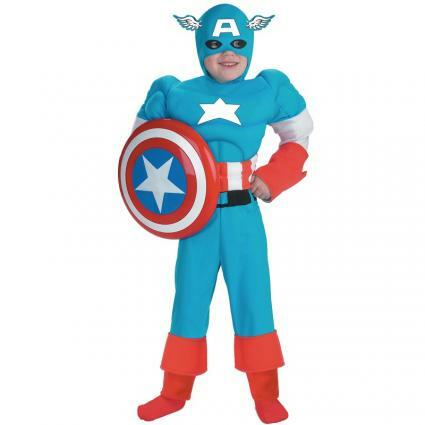 Available from BuyCostumes.com, the Captain America Deluxe Muscle Child costume captures the comic book look perfectly. This complete costume comes with a muscled bodysuit with a belt and attached Captain America hood. It comes in sizes small, medium, and large and retails for about $35. If you have a little extra time on your hands and want to get creative with your look, you can make your own costume. Whether you choose to make the movie Captain America or the classic comic book version, just follow these step-by-step instructions. Begin by sewing the shoulder pads into the shoulder seams of the blue t-shirt using blue thread to match. Follow the instructions on the shoulder pad package. Use the iron to apply the iron-on star to the front of the t-shirt. Arrange the red and white striped fabric so the strips are vertical. Fold the fabric in half. Lay the blue t-shirt on top of it and carefully cut a strip that is about one inch wider than the t-shirt and about eight inches tall. Apply the iron-on tape to this strip of fabric use your iron to attach this red and white portion around the waist of the t-shirt. Overlap the edges neatly and use the iron-on tape to secure them. Reinforce with the sewing machine if desired. Take the old boots and the bike helmet outside or to a well-ventilated area in your home. Using light, even coats, spray the boots with the red spray paint. Cut off the straps on the helmet and spray the it with the blue spray paint. Allow to dry thoroughly before handling. Use craft paint to apply a white "A" to the front of the helmet. If you're creating the comic book version, also paint white winged shapes on either side of the helmet. Using the blue craft paint, apply an even layer to the eye mask. Allow all the paint to dry thoroughly. To put on your costume, first dress in the while long-sleeved shirt and blue leggings. Then put on the blue t-shirt and tuck it into the leggings. Wrap the black belt around your waist, and put on the boots, helmet, mask, and gloves. You're all set! 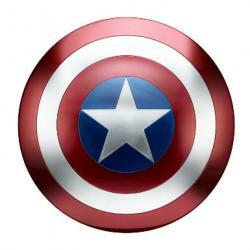 Amazon.com sells a Captain America shield that's 12.5 inches in diameter and retails for about $13. Party City has a 13-inch plastic shield for about $15. No matter which Captain America costume you choose to make or buy, you'll love the fun of emulating this beloved character. Add some superhero-sized confidence, and your look will be complete.